We have been awarded £897 by the Police & Crime Commissioner for South Yorkshire and Barnsley Chronicle to support more local people with voluntary experience and inclusion in their community. 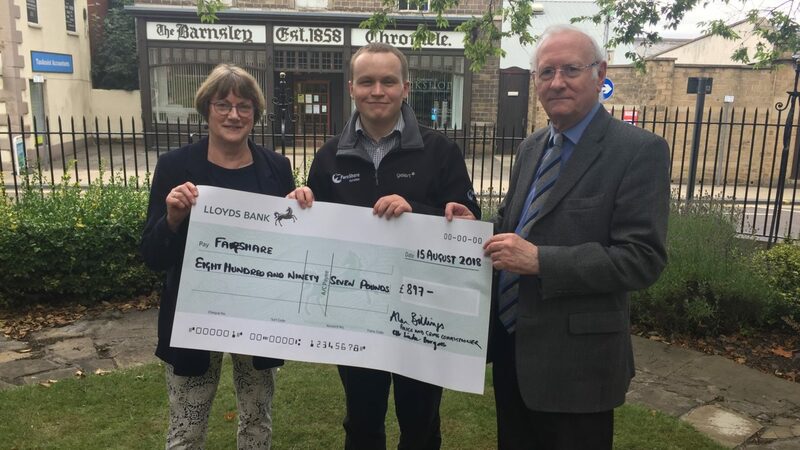 The grant was presented to our Office & Development Manager Jonathan Williams by Dr Alan Billings and Councillor Linda Burgess on August 15 outside St Mary’s Church in Barnsley. The grant will enable FareShare Yorkshire to provide 10 additional volunteers with on the job experience and mentoring, especially local unemployed people who have either never worked or spent many years out of work. Over the last few months we have noticed that a growing number of volunteers who want to attain forklift truck permits with us require intensive support and additional months of warehousing experience before they are ready to consider technical training or employment. This funding will enable us to provide people with extensive experience in a gold standard warehouse where people can develop skills and confidence in their own time.